Home › National bird of India › Tibetan snowcock › Himalayan snowcock - Tetraogallus himalayensis. The Himalayan snowcock (Tetraogallus himalayensis) belongs to the pheasant family, Phasianidae. The Himalayan snowcock occurs in the Himalayan and Pamir ranges. They are distributed in India, Kazakhstan, Tajikistan, Afghanistan, Nepal, Pakistan and China. There are six recognized subspecies, of which T. h. himalayensis occurs in Ladakh region in India. These birds had been introduced by the Nevada Fish and Game Commission into Nevada region and a wild population has established itself in the Ruby Mountains. The International Union for Conservation of Nature (IUCN) has categorized and evaluated these bird species and has considered them of "least concern". The Himalayan snowcock is a fairly large bird and is 50-75 cm in length and 2000-3700 grams in weight. The head pattern resembles chukar partridge. The male birds are larger than the females, but the plumage is similar. The legs and orbital skin are yellow. 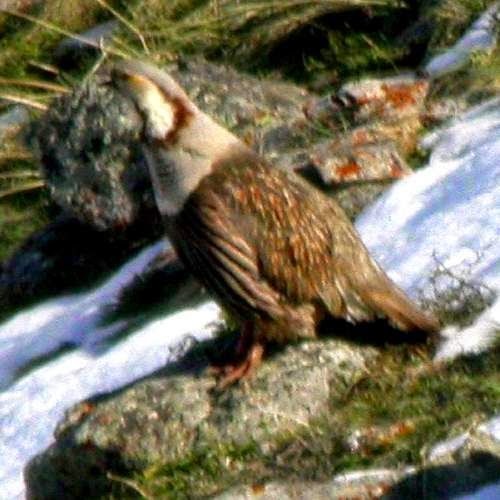 The Himalayan snowcock inhabits mountain slopes below the snowline. In Indian Himalayas, they are found in the elevations between 4000 to 5000 meters in the summer, coming down to lower levels in the winter. They feed on grass blades, bulbous roots, berries, tubers, shoots and seeds. They move in flocks. They breed during the summer months, between April and June. The male is monogamous and territorial. The nest is formed as a depression in the grass. The nest contains a clutch of 6-12 eggs and female bird incubates the eggs. Current topic: Himalayan snowcock - Tetraogallus himalayensis.